Thai cuisine was influenced by China and India, evident in the stir-fry technique and the curry concept. But Thai food is definitely distinct from both since they use their own spices, fresh herbs and vegetables; and is characterized by a particularly balanced combination of sweet, salty, bitter, sour and spicy tastes. Thai cookery flourished because it is very artful, and employs stimulating ingredients such as tangy fish sauce, coconut milk, and fragrant lemongrass, basil, coriander, and citrus fruits. We love all those wonderfully vibrant Thai red, green, yellow, masaman and panang curries. All are delectable. I recently enjoyed a Thai green fish curry locally that was so laudably luscious it deserved mention. Happily, the green fish curry in my kitchen is every bit as enthralling as that prepared in local Thai restaurants. Green curry is made with fresh, young green chilies, and is usually significantly hotter than other curries but not necessarily; as you can control the heat by manipulating the ratio between the amount of chilies and the coriander. Green curry tends to lean toward a sweeter flavor as opposed to say a red which tends toward the savory. Heat the oil in a skillet or wok. You can serve this aromatic ambrosia over steamed rice. 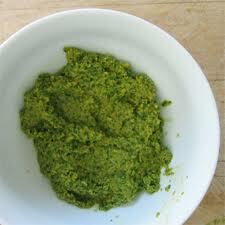 Put all the ingredients in a blender and whirl to a paste. If necessary add a little water. If you cannot find shrimp paste, forget about it. More green chilies can be used if desired or less for a milder taste. If using less, add a little more fresh coriander. Thai green fish curry is a flavour phenomenon; I hope you will try some soon. Looks Divine..I love Thai curries. Hi Anthony! Sounds like an interesting dish. i love curry and am always looking for dishes to use it in! That looks delicious. Sort of reminds me of pickled fish, another Malayan South African dish like bobotie. Thai green fish curry looks delicious. This recipe sounds delicious. I like curry with a bit of sweetness so this fits the bill. Now I want to head right over to Curry House and see if they have anything like this on the menu. I am always so intimidated to attempt Thai food because I thought that it contained all these hard-to-find herbs. Not so. It looks delicious. I'd eat that for breakfast right now. Yummy n delicious looking fish curry. MEGS DELICIOUS ADVENTURES: We love them too, thanks for calling. SUSANNE DRAZIC: Hi Susanne, I hope you get to have some soon. LYNN PROCTOR: You will love this. MISHA GERICKE: Pickled fish, oy Misha, you know a lot of good foods. Thanks for calling and good luck with Doorways. Keep smiling. SWATHI IYER: This curry is fabulous. Thank You very much for the Challah link, I love that loaf. LOLY: You might love this fish treatment, the sauce is delicious. GAIL M BAUGNIET: This should appeal to you Gail, and you can adjust the sweetness if you desire. MISSED PERIODS: I know exactly what you mean. If you can find the jarred or canned thai curry sauces (red, green and yellow)you are halfway home. I like a hearty breakfast too. MY JOURNEY WITH CANDIDA: The taste of this is wonderful, please enjoy. GENE POOL DIVA: You are really cool; so you're going to suggest he make this dish after he cleans the fish and all. Way to go Gene. HEMALATA: Thank You, it is all that. I love the smell and taste of curry, but never really cook with it. Maybe because I don't know how. But I do love to eat Thai food. LIZZY: This lovely fish curry is definitely delish, I'm happy you liked it. SUSAN OLOIER: Now you can make nice curry in your own kitchen and I hope you do. Meanwhile, best wishes to Zane. What great flavors here nice job !! Yum, this looks so delicious and not too difficult to make. I already have most of the incredients. 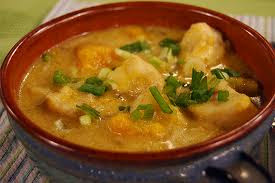 LYNDA R YOUNG: Thai green fish curry is not difficult, even if you make the curry paste yourself. You and your family will surely enjoy it. SARAH: You have summed it up beautifully, thanks. Thai curries are so tasty! Love the sound of this soup. JOANNE: Thank you, yes they are, I hope you get to try some soon. Yummy post! Steve and I love Thai food. I make our favorite Pad Thai all of the time. But I will be sure to try your recipe. I practically did drop off the face of the earth. And I apologize for not responding to your comments sooner. Between the Alice B. Tookus Baking Company and visiting our favorite city, New Orleans, for vacation I have had little time for anything else. I am sure I will fall into a rhythm eventually. SANDY AXELROD: So glad to hear from you. I lived in the Crescent city for 30 years and have many great memories there. I heard you gave up the localvore dream, a shame, your rv looked so nice. You all take care of yourselves; blessings. This looks so good! I really like Thai food. I love Thai green curry and the way you made this is truly wonderful! Just came back from phuket a month back and one of the few dishes which we devoured every day spent there was Thai green curry. I loved your pictures, and these are making me nostalgic and hungry! GINA GAO: Thank You, it is really delicious. PURABI NAHA: Thank you Purabi, I wish I could visit there I love Thai food. KALYAN P: It is that, thanks.